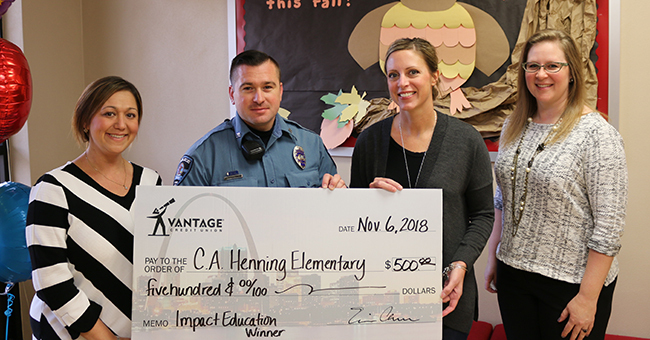 Our Impact Education contest has ended, and five local schools received $500 to $2,000 to fund projects meant to positively affect the students. The five winners were Affton High School; C.A. Henning Elementary in Troy, IL; Wydown Middle School in Clayton; Willow Brook Elementary School in Creve Coeur; and East-Alton Wood River Community High School in Wood River, IL. The schools each received one of five prizes: two $500 prizes; two $1,000 prizes, and one grand prize of $2,000. 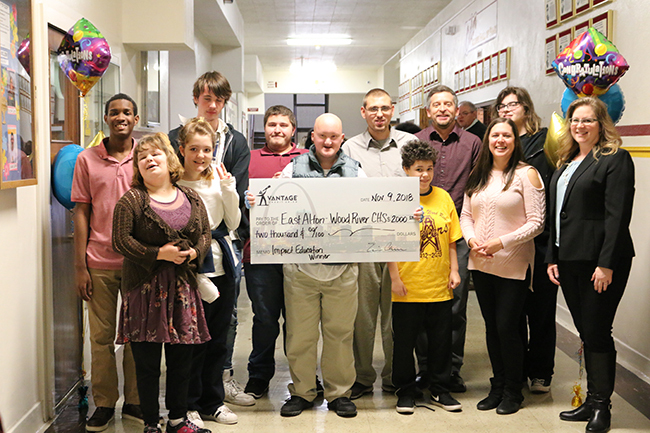 Vantage was onsite at each school to present the check to the winners and learn more about how the winnings will be put to use. 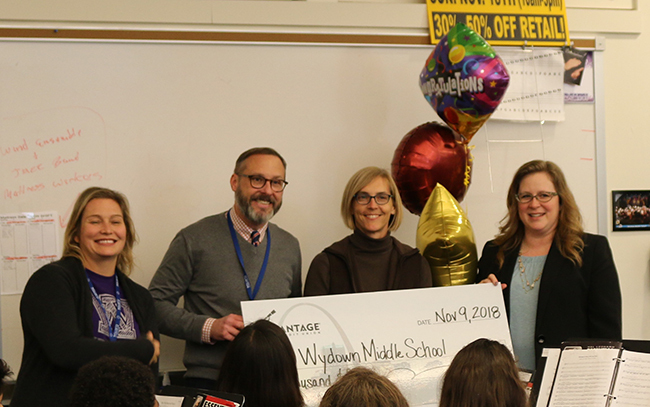 Kinkel, our grand prize winner, works with students with disabilities and her school plans to use the funds to start a cafe run by the students in her classroom. They’ll get the opportunity to develop real-world skills involved in the sale of goods and maintenance of the space—and they’re even involving the whole school! Woodworking students will do some of the building projects for the space, art classes will display works for viewing or sale, and they’re even hoping to create an “open mic” area for students to share their talents. The space is intended to be a sort of “lounge” area for students. Other winners want to use the funds to directly impact a particular classroom. 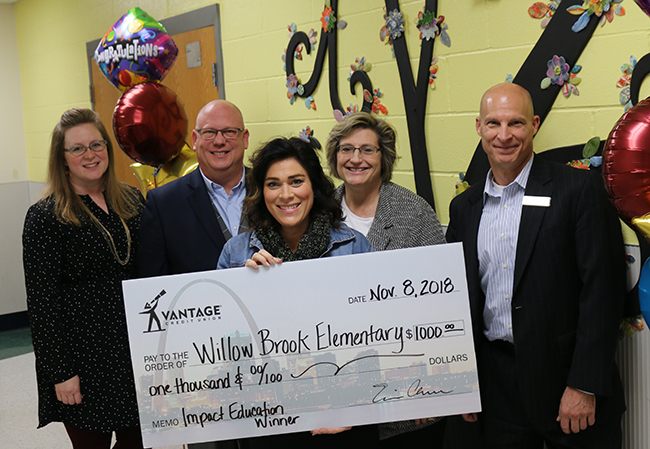 For Willow Brook Elementary winner and art teacher Dawn Lynn, her idea of take-home art kits for her students had their artistic expression at the forefront. A common sentiment from the winners was gratitude for their school and community coming together to vote for their entries and spread the word. Impact Education ran during the month of October, and asked local educators to submit 60-second videos explaining how they would use funds to positively impact either their school, their students or their professional development. After the submission period, visitors to vcu.com/impact-education could vote for their favorite submission. We are so proud of everyone who entered and seeing the support and involvement of the community has really inspired us. We want to thank all who entered the contest, as well as any who voted, for making our community and our schools stronger!